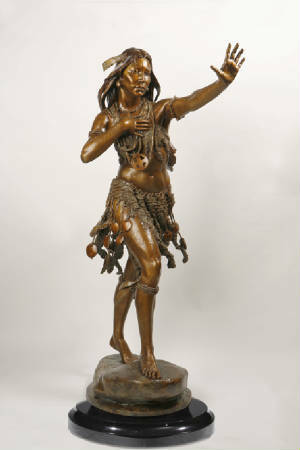 Bronze Maquette, 1/3 life- size, approx. 25" high. Limited edition of 35. A FEW WORDS FROM THE ARTIST: ULELE is a Native American woman from one of the "lost tribes" of Florida. In the early 1600’s she saved the life of Juan Ortiz, a Spanish sailor. 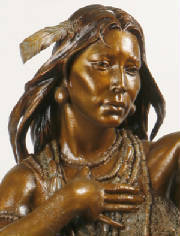 Her father was the chief of the Tocobaga Chiefdom that lived in Tampa, Florida. Her jewelry is shell beads and pearls. Her costume is made of Spanish moss. The legend of ULELE is fascinating. CNN did a story on her and the monumental size of this sculpture". Bronze Monument, 1115 life- size, approx. 6 feet high. 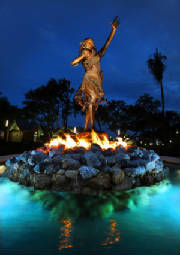 A 115% life-size MONUMENT of this sculpture is placed in by the Ulele Restaurant in Tampa, Florida. 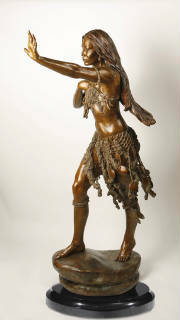 The edition is closed, additional casting of the ULELE monument are not available for purchase. CNN did a story on ULELE and the monument."